Owning an old home is a gift and a treasure to be handed down to the next keeper of the past and future of our bed and breakfast in Jefferson Texas. One of my favorite things is when someone comes by to tell us a little history or shares a tale from a memory of the home we now live in. This story is not one of those but an interesting story none the less! A few weeks ago I came home from downtown to find a car parked out front and a lady trying to clean the street sign with the end of a cane. I walked over to inquire what they were doing. To my delight they wanted a picture under the sign that says “Benners”. I dipped a rag into the fountain to clean it off better and they told me the story of why they wanted this photo. There were two couples in the car; a father and his wife and their son and his wife. They had just watched the “Presentation of Colors” in front of Christ Episcopal Church at Lions’ Park. This year’s performance featured the 153rd anniversary of Fannie Benners’ presentation of a hand-sewn banner to the Jefferson Guards, a unit formed locally in 1861. With troops at attention and roll called, Miss Benners’ presentation was preceded by the reading of her moving letter to the men before going off to war. The Older gentleman said that he was the great grandson of Rev Edward Graham Benners who came to Jefferson in 1850 and established a law practice here. During the Civil War, he was a Chaplain in the Confederate Army. He served Christ Episcopal Church in Jefferson, first, as an organizer, then as a Lay Reader and finally as an ordained Priest. 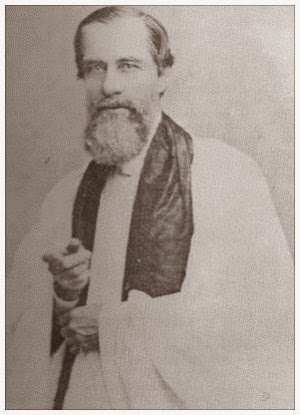 He was the first full time Priest of Christ Episcopal Church. Since our home is on Benners Street they thought it may have been a home he lived in. Unfortunately hour house was built in 1911 so it was not lived in by the family. This news did not deter the picture or the force that brought them to our front yard though. We had a lovely chat and took some pictures for them and they were on their way. 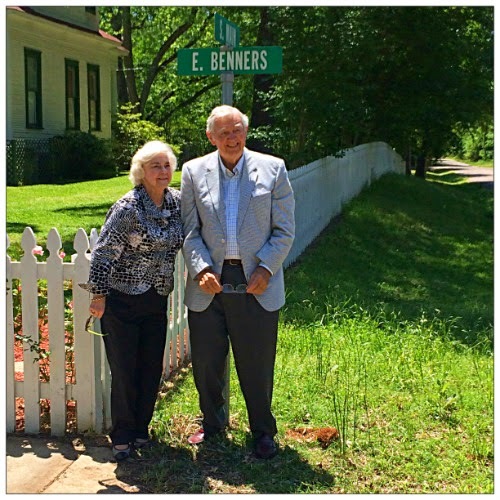 We do know that the Benners family was very prominent in Jefferson’s past so this is one reason our street is named after them. As the stewards of this home David and I cherish stories from locals and people who stop by. We really try to take down a record so the history is not lost forever. This entry was posted in About Us by Tammy D. Bookmark the permalink.